Netanyahu: Israeli strike on Iran's nuclear facilities could cause "significant damage" but only a US attack could halt operations. 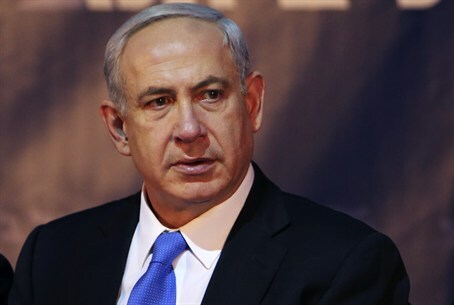 In a plea to Israel's closest ally, Prime Minister Binyamin Netanyahu stressed that an Israeli strike on Iran's nuclear facilities could cause "significant damage" but only a US attack could halt their operations. According to Maariv, Netanyahu told a visiting delegation from the American Jewish Committee that only US military action could completely halt Iran's nuclear program, which Israel and much of the world believes is a guise for building a weapons capability, AFP reported. And he also hinted that any US military activity ought to be carried out before Tehran finishes the process of enriching uranium to 20 percent purity, the paper said. "The sanctions are only likely to stop Iran if there is a credible (military) threat over their head... and in order for it to be a credible threat, you need to mean it, meaning that if the sanctions don't work -- and they haven't until now -- you will use it," he said. Referring to a military strike, Netanyahu described it as "a defined and specific mission that the United States is capable of carrying out perfectly whereas we are capable of causing (only) significant damage." He also stressed the need to halt Iran's ongoing enrichment efforts. "We must prevent the completion of the enrichment process," he said in a likely reference to the process of enriching uranium up to 20 percent, one step before military grade uranium. Should Tehran complete that process, "Iran would have enough enriched material to build a bomb in a short time," he said. He also said the window of opportunity to stop Iran through diplomatic and economic means was about to close and that 2013 would be a decisive year, Maariv said. Israel has consistently refused to rule out a resort to military action to prevent Iran developing the capability to build a nuclear weapon. But Tehran denies any such ambition, insisting its civilian nuclear program is for peaceful power generation and medical purposes only.